About this time last year I posted my experience with my first breast MRI (see ‘Happy Dancing‘ in Archives or click on the link). Whenever I learn something new I like to share it so here we go with this year’s experience. I am not at all a fan of recreational drugs, but the well used drug in therapeutic circumstances is such a marvel. After my difficult experience with the panic attack last year the surgeon suggested I take a 5mg Valium tablet about an hour before the test this year. Of course the surgeon lives 1500km away from Alice Springs so it was my GP who had to write the prescription when the time came, and his advice was to take the Valium 2 hours prior to the test. Not being familiar with Valium, I wasn’t sure whose advice to follow but in the end I thought my GP might have a better knowledge of my history so I took his advice. The variables were a bit complex however as I had an empty stomach (on purpose), and a thirty minute walk to the hospital and then the appointed time varied by 30 minutes from what I’d thought it would be. By the time they called me through to have the cannula inserted for the dye I realised it had been two and a half hours since the Valium and it was already wearing off. This started to make me more anxious and when I saw the technician I explained to her my situation. And then I cried. I’ve hardly cried through the entire treatment of the breast cancer even though at times it was quite confronting. Facing fear is one of the things that helps us grow. I know… but… are we having fun yet? The technician was very calm and matter of fact, assuring me she could make ‘modifications’ to things that would make me more comfortable. Oh really? Could she disappear the tube and put me to sleep during the entire process? I didn’t think so. However, it turns out she could modify the framework on which I had to lay. She opened the area where my face rested so that I would feel I could breathe more easily. She placed a softer block of high density foam on which to rest my forehead. And the most important thing she did was tell me to breathe normally! Previously, the last words said to me as they shoved me into the tube was ‘no deep breaths’, which I had somehow misinterpreted as ‘take shallow breaths’ and which resulted in my panic that I could not get enough air. The technician encouraged me to think about something I like doing… my next jewellery project perhaps? But all I could think about was the vanilla slice Don had found in town, and had told me about earlier! Go for it girl, I thought, think about that vanilla slice for all you’re worth! By the time the technician’s voice came through the headset to tell me she was about to inject the dye, that vanilla slice had saved the day. I was pretty sure I would be okay. When the scan finished and I felt them move me out of the tube and into the room, I stuck both thumbs up for the technician to see, and to celebrate my victory. 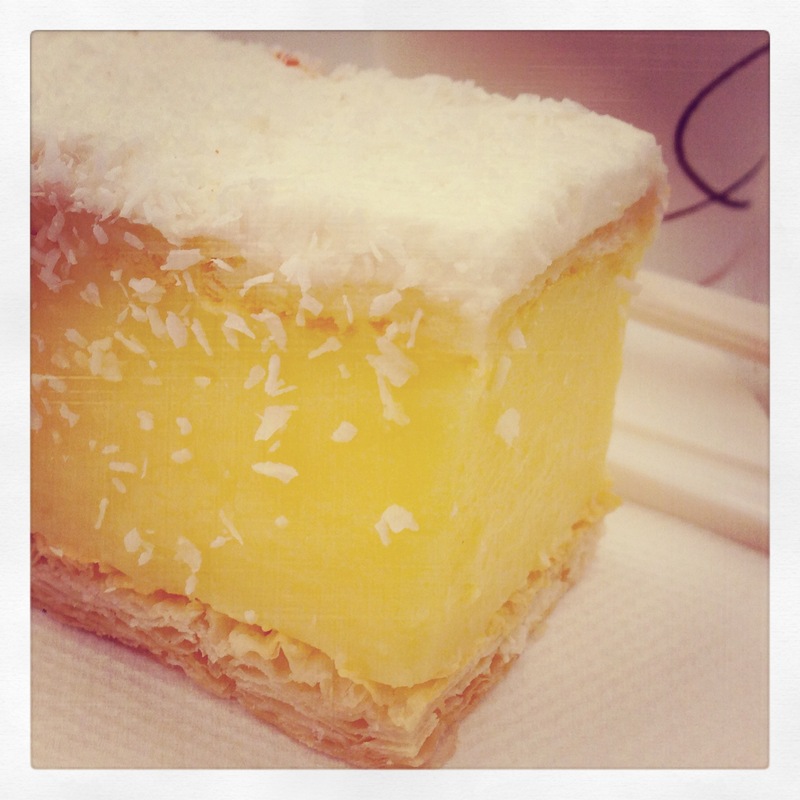 But the final celebration was awaiting me… a thirty minute walk into town… the taste of victory, thy name is vanilla slice. PS. 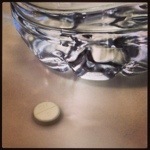 Take the Valium an HOUR before the test for maximum benefit! Apart from being just so great to read this and hear you are fine, wonderful news – that is one mighty fine vanilla slice (you didn’t have two by any chance?) ! I had only one vanilla slice but I confess to doing some serious damage to a few chocolates from my fave chocolate shop Haigh’s in Adelaide… Pistachio fudge, cardamom chocolate, violet creams… I’m a very bad girl!! I am grateful for good results. Bigs hugs for you! Thank you Paul, much appreciated. Love to your Mom and Dad from me! I wasn’t sure where this post was headed when you started out with “recreational drugs”! But it ended with good experiences, lemon slices and lots of chocolate and most importantly, a clear report. Life doesn’t get better than that. Hehehe, thought I’d spark a bit of interest with the reference to recreational drugs, just to keep you on your toes! Mammograms were most certainly designed by a man. They are torturous and the one I had this year was the most painful one I’ve ever had. It was a female operator who had no mercy. I do understand they have to get the tissue very flat, and in my case it is hard because the breast tissue is very dense, which is why I also have to have the MRI. I try not to feel sorry for myself because in some ways I feel very lucky to live in these times where there are such tests, rather than in my Grandmother’s time when surgical treatment was really quite primitive and bordering on cruel. Thank you for sharing… I can just imagine the technician’s face, very funny! Glorious day today, about 20 C and sunny! Hoping for no rain for you for a couple of days.